For someone so concerned with "beautiful statues," Trump seems to have forgotten his own track record with historic artifacts. President Donald Trump took to Twitter on Thursday to condemn the removal of “beautiful statues and monuments” around the United States. His remark came just days after a group of white supremacists protested the removal of a Robert E. Lee statue in Charlottesville, Virginia. The resulting tension between neo-Nazis and counter-protesters in the city’s Emancipation Park came to a head when 20-year-old James Fields Jr. drove into a crowd, killing 32-year-old Heather Heyer with his car. Since the weekend’s disturbing events, city officials in Baltimore, Maryland, have quietly removed four of its Confederate monuments in the middle of the night. Demonstrators tore down a similar statue in Durham, North Carolina. For someone so ostensibly concerned with history, Trump seems to have forgotten his own track record with historic artifacts. In fact, shortly after the president tweeted his remarks, The New York Times’ Michael Barbaro kindly reminded Trump that he had destroyed a “beautiful statue” in 1980 in order to construct Trump Tower. 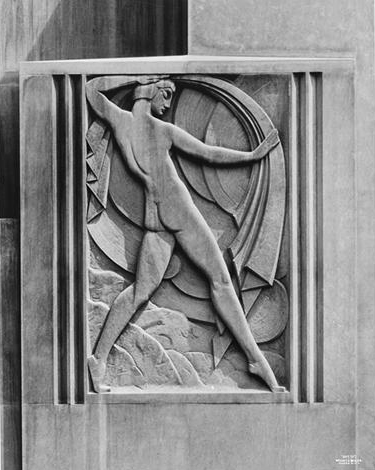 To build his skyscraper, Trump demolished the Bonwit Teller building, which was erected in 1929 and included a historically significant Art Deco relief. The Metropolitan Museum of Art was reportedly interested in preserving the artwork around the time of the building’s demolition, and, according to a 1980 report from the NYT, Trump originally agreed to donate them to the museum as long as the price wasn’t too high. Exterior view of Bonwit Teller store on 56th street and 5th Avenue. During the development of his hotel, Trump did away with much of the edifice’s original interior, even after pledging to preserve certain elements. He put carpet over the floors, covered up windows, removed plaster walls and installed gold leaf. Eventually, John Cullinane, who was serving as a preservationist architect for the development project, resigned from his position. Visitors ride in an elevator at the Old Post Office Pavilion in Washington, D.C., on Thursday, June 20, 2013. Along with destroying historic relics, Trump has also apparently fabricated one of his own. During renovations of a Sterling, Virginia-based golf course he purchased in 2009, Trump installed a stone pedestal commemorating the lives lost in “The River of Blood,” the NYT reported in 2015. Furthermore, despite the fact that Trump bemoaned “our great country being ripped apart with the removal of our beautiful statues and monuments,” he is actually the only president to ever suggest rescinding a national monument’s status, according to The Atlantic. According to the Antiquities Act, only Congress can “undo” a national monument after it’s established. In direct contradiction to his claims on Twitter, Trump has an established record of altering, destroying and fabricating “beautiful statues and monuments.” Particularly when it proves advantageous. To himself. Monumental Changes For Confederate Statues?